RockSolid Floors® (http://www.RockSolidFloors.com ) now provides Menards® customers with the ultimate combination of strength and value in the flooring industry with their Polyurea Grey Garage Coat®. “Our Grey Garage Coat® is the perfect way for Menards® to deliver the ultimate in strength and value, powered by polyurea technology,” says Patrick Ilfrey, CEO of RockSolid. RockSolid Floors® proudly announces that their RockSolid Polyurea Grey Garage Coat®, the best value among their industry-redefining One Part Polyurea floor coatings, is now available at Menards®. As one of the leading home improvement centers in the country, partnering with Menards® is a perfect fit for Twin Cities-based RockSolid Floors® and their revolutionary Polyurea Grey Garage Coat®. It has a virtually unlimited pot-life, allowing installers as much time as they wish to finish their projects with no waste. The unique composition allows it to retain polyurea’s usual 4 to 8 hour cure rate and 24 hour return to service when applied, despite its unlimited pot-life. Polyurea is 20 times more durable and 98% more flexible than epoxy, ensuring that it outlasts any epoxy or vinyl system currently on the market. It also has ultra low VOCs to make it environmentally friendly. The Grey Garage Coat® package comes with an instructional DVD and booklet, safe etch, decorative chip, and the specially-designed RockSolid Floors Foam Roller™. This roller is the key to creating the exact thickness needed for optimal performance, providing the most professional finish available. Everything needed is right in this single package. RockSolid Floors® is an affiliate company of Citadel Polyurea Coatings®, launched in January 2008. Citadel Polyurea Coatings®, a leading manufacturer of polyurea floor coatings, evolved over 40 years from a mid-size installation company into the leader in one-day polyurea floor applications. Headquartered in Minneapolis, MN, they began with foundation and horizontal pre-cast waterproofing, concrete restoration and polishing, as well as steel and bridge deck coatings. Their focus later shifted to engineering advanced polyurea floor coatings. Citadel Polyurea Coatings’® manufacturing division has been developing and applying polyurea coatings for over 25 years on a large variety of substrates. They are widely known for manufacturing and installing polyurea floor coatings everywhere from residential garages to commercial kitchens to warehouse facilities. The collective practice gives them over 65 years of experience in the coating industry. For more information about RockSolid Floors® or their new One Part Polyurea Solutions, please visit http://www.RockSolidFloors.com or contact Mike McAllister at mike(at)rocksolidfloors(dot)com. RockSolid Polyurea Grey Garage Coat®The RockSolid Polyurea Grey Garage Coat®, the best value among their industry-redefining One Part Polyurea floor coatings, is now available at Menards®. Everything needed is right in this single package. 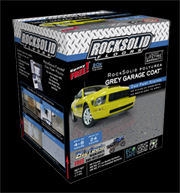 RockSolid Floors® Grey Garage Coat® contentsThe Grey Garage Coat® package comes with an instructional DVD and booklet, safe etch, decorative chip, and the specially-designed RockSolid Floors Foam Roller™.